As you may have noticed, I have a thing for stews and chills, AND I also have a thing for using a slow cooker. Here is a simple, yet delicious chili. When I make Tex-Mex Chili, I like to gather a second batch in a freezer bag while prepping the first batch in the slow cooker for dinner. That way I have one for dinner and one batch saved in the freezer for another day. Two dinners in the time it takes to make one? Yes, please! 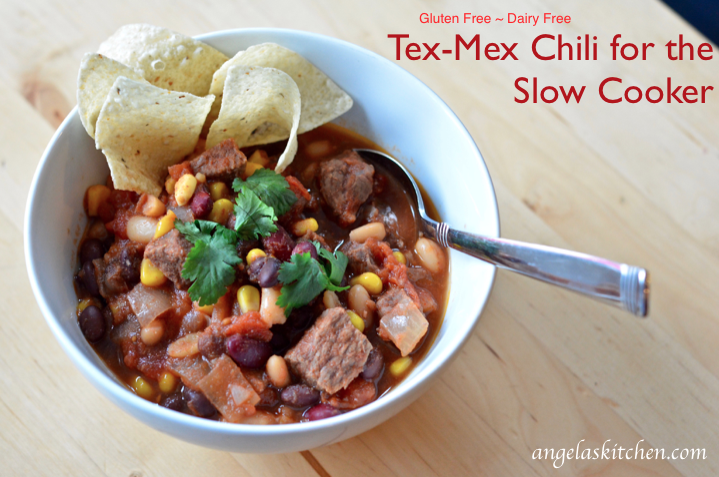 Printable freezer labels for Tex-Mex Chili. In a 4 quart slow cooker mix together beef, tomatoes, onion tomato paste, and spices. Cover and cook on HIGH for 6 hours or LOW for 8 hours. One hour before end of cooking time, stir in beans and corn. To freeze: In a freezer safe bag mix together beef, tomatoes, onion tomato paste and spices. Remove as much air as possible and seal. In a second freezer bag place beans and corn. Remove as much air as possible and seal. Package both bags together, label and freeze. To serve: Thaw. Put contents of bag with meat and tomatoes into a 4 quart slow cooker. Cover and cook on HIGH for 6 hours or LOW for 8 hours. One hour before end of cooking time, stir in beans and corn.